Of all the Brent Walker videos, Cox & Box has earned the most praise. Many of the Walker productions failed by getting too cute with the video medium, by making unconscionable cuts, or by casting Americans who were out of their dramatic depth. Here, directors Alden and Heather adopt a "Masterpiece Theatre" style, letting the material tell its own story. The three principals are experienced British singers. And, far from cutting anything, the production actually restores the seldom-heard gambling duet. This is the one entry in the Walker series that can be recommended without reservation. No. 1 (Overture) — Same in all versions. No. 2 (Bouncer's song) — Verse 1 restored, but in transposed to the E minor/major of Savoy version and missing a few bars of original intro to each verse. No. 3 (Cox-Bouncer duet) — Savoy version, except that a "first" verse of "Now coals is coals" is included as a second verse to the same music, whereas the original music is similar but not identical. The original and Savoy versions differ so much that it would be almost impossible to reconstruct the former from the latter any more than was done. No. 4 (Box's lullaby) — Verse 2 restored (1867 version, not 1866). No. 5 (Cox's song) — Same in all versions. No. 6 ("Who are you, sir?") — Savoy version, although it doesn't differ all that much from the original. The original had Cox and Box sing "Printer, printer" and "Hatter, hatter" separately to the same melody that is now a unison duet. The original ended in G major instead of Savoy version's F major. No. 7 (Serenade) — Verse 2 restored (Box's "concertina" cadenza was part of the original Verse 2). No. 8 ("Not long ago) — Original and Savoy versions are the same, but DCOC made a couple of small cuts that BW made as well. Gambling duet (No. 9 in original, omitted from Savoy) — Complete except for cutting the "Rataplan" reprise. It's the only orchestration BW used that's not in the Savoy version. I don't know whether it's legit or how BW found it. Finale (No. 10 in original, No. 9 in Savoy) — Savoy version, which is close to original except for cutting a brief reprise of No. 2. The dialogue is virtually complete, but as Phil points out, "the lines that follow 'Then it is he!' are still deleted, which makes sense — it makes such a great final line." 1999 Roadshow VHS PAL 102020 This is an Australia/New Zealand release. Unlike all others, it does not include Trial by Jury, but it is still offered at the same price as a full-length opera. 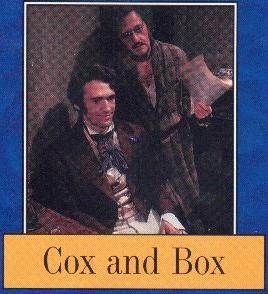 The same publisher also offers a four-video package that includes Cox and Box, Trial by Jury, The Sorcerer, and H.M.S. Pinafore.